As with most of T-Mobile’s announcements there are various questions. They are great offers, but sometimes need a little decoding to make full sense of everything that’s just been announced. So let’s tackle all the bullet points of today’s announcement piece by piece. This is a combination of two different offers. Firstly, and to get it out the way, tablet buyers have been able to get 200MB of free data for life when they buy a tablet from T-Mobile since November last year. This offer remains. And regardless of what other offers you take advantage of, you will continue to get 200MB of data per month for life when you buy a tablet. That’s not changing. So, technically, what appears to be happening is that you get $10 off the $20 1GB mobile internet plan that you’d normally get for opening a Mobile Broadband line as well as a voice line, plus, an additional $10 off in this promotion. This is $20 total monthly discount, effectively making the data free. You can’t get the free 1GB data without a voice plan, whether that’s an existing one or one you sign up for in store when you get your tablet. The extra $10 off your mobile data plan disappears from the end of 2014, but the $10 off, that’s been on offer for taking Mobile Broadband with your voice plan might not. Clear as a bell, right? This offer is open to customers buying a new tablet, trading one in or bringing their own. Of all today’s announcements this appears to be the most clear-cut. Any of T-Mobile’s LTE tablets currently on sale will have their prices cut to match those of their Wi-Fi only counterparts. So, a $639 iPad Air Wi-Fi + Cellular model is dropped to $499. As with most of T-Mobile’s products, you can opt to pay for it using the company’s EIP (Equipment Installment Plan) without paying anything up-front. There are terms to this though, if you want it at the discounted price, and on EIP, you have to sign up to – at least – a 1GB postpaid mobile data plan. (That’s the $20 plan mentioned above, which you could effectively get for free if you have a voice plan too). In essence, that means that as long as you have the EIP installments going out on the tablet, typically for 24 months, you have to stay on your $20 mobile data plan. So between now and the end of December, you get your 1GB for free, but after that you have to keep paying monthly for it until you’ve settled the balance on your EIP. Another string to Operation Tablet Freedom’s bow is an existing Uncarrier offer, expanded to cover tablets. If you’re in contract with another carrier, T-Mobile will pay your ETF when you switch from any of the other carriers. It works the same way as the phone offer. Bring in your old device for trade-in credit, purchase any tablet at the new lower prices with $0 down on EIP, then send in your final bill from your old carrier to T-Mobile and they’ll pay your remaining charges. And that’s it in a nutshell. To read up on today’s announcement, check the T-Mobile Newsroom or the Operating Tablet Freedom page which includes the full terms and conditions T-Mo’s website. If I’ve got any of this wrong, I’ll update the post. Offer one isn’t correct. When you have a voice line with T-Mobile and activate MBB service you get a $10 discount. So if you activate with the 1gb plan, it goes from $20 each month to $10 with the discount. Then during the promo period until the end of the year you get an additional $10 discount to make it free. The original $10 discount has been in place for years. I’ll edit it to make that clearer. Does TMo offer data only plans with SIMs that can be put into any device including USB modems, Windows PCs, hotspots, Android/iOS tablets, etc.? The last time I had TMo for data only service, they restricted Android/iOS tablet SIMs from being used in non-Android/iOS devices. I think it has changed to make the Sim usable/applicable across the board with their new data only plans. yes. the device determines the ability to connect. I don’t think your EIP assumption is correct. It just says “Must remain on qualifying service”, not that you have to keep the current 1GB plan. Right now you can get EIP and only have the free 200MB plan. Only if you have a voice line. i buy any tablet outright .. i cant see having a tablet on a data plan. wifi takes care of things and hotspots when i’m out and about. I can definitely understand and feel where you are coming, except when our phones die and we need that quick email. It does not justify the extra cost normally and that’s why this deal can be beneficial for those who take advantage, though I got lucky and found someone selling their “Verizon” nexus 7 for $150 so it doesn’t matter to me now, though I hope this type of deal continues to the next N7/8. I can see where it would be very useful, especially if you have an application that you use for business on an android or iPad. Obviously you can tether but the reality is that $10 a month is worth it to not have to mess with tethering. So you can’t sign up for this until the 12th? Saturday? I called, they said check back on the 12th. Just don’t hope for an employee discount. Another site said it starts April 12th, so Saturday. The $10 discount for having a voice line is not going to go anywhere, T-Mobile has been offering that offer for voice customers since the conception of mobile internet on t-mobile’s networks since 2009. Way to go Big Pinky! I really want to take advantage of this but the current list of tablets do not appeal to me. I want the Galaxy 10.1 2014 edition or one of the new tablets Samsung just released. With the data plan for the tablet plus the what is it 1 GB of free tethering that comes with my current Note 3 data plan, I have more than enough data to fulfill my needs. I would totally take advantage of this if they some better tablet options. I just checked and it looks like they only have four options with two being versions of the iPad and two smaller Android devices. If they’d bring in a few of the newer 10″ Android tablets and/or some decent Windows tablets I’d get one right now. With the weak selection they have I’m just going to have to wait. Based on others’ comments I’m definitely not alone. If that’s real, then the available tablets is extremely disappointing. I’m not sure, but it’s something to look at. Hope they include Chromebook 14 to the list as well. I’m using it on the original CR48 Chromebook. Took about 40 minutes to get through to someone who knew about the promo when I called. I was told as long as the device accepted a sim it was eligible. If I purchase a $499 LTE iPad (no EIP) can I just use it with the free 200mb? Or do I have to activate it with a 1gb/mo plan? If so can I just cancel the 1gb plan right after leaving the store (since it’s not on EIP) and just use the 200mb? p.s. I don’t have voice service with T-mobile. Sure of course. In your case, you would order the SIM from the prepaid website. Once you get the SIM, you install it in the device, then with the device’s browser, you go to a specific website to register. After that, it will provide you 200mb of free data per month from there. My main question is what the price is if I buy the LTE iPad Air outright: is it still $499 even if I don’t buy it with a contract? It isn’t clearly explained so far. There are no contracts. There are no required data plans. Try the shopping cart, it should be programmed with the business rules. And that’s why when you get to the processing screen you will get an error tomorrow. LOL. There is a requiring participating plan and 200MB is not one of them so the AIR will be $630. Even if it was not, you could sign up for EIP and pay off early. you ARE entitled to free data on the device purchased outright. you are not required to purchase any data plan if you buy the device outright, so there would be no line to cancel. if you don’t have a voice line, you don’t get any discount on service like tmobile customers do – so, 1gb would be 10 (until 2015), 3gb would be $20, etc. My question isn’t so much whether or not I can use the 200mb (I know I can), its that if I buy the tablet outright, to use with the 200mb plan, is it still discounted to $499? Or is it only $499 if I have it on a 1gb plan? You won’t get the tablet for $499 with the 200MB data even if you buy it outright. It will be $630 for the Air. Talk about bad timing, I just purchased a mini ipad last weekend at t-mobile. I wonder if they will adjust the difference or will I just have to return it since I am with in the 14 day return policy period. Then you will have to wait 24 hours before you can finance another tablet. Is the $75 and wait time worth the slight discounted price? You might save $25-$50 doing so, but you will be required to maintain at least the 1GB data plan instead of the free 200MB plan. I doubt they will allow for an adjustment for the difference. You may find a nice store that will apply a “credit” on your account, but I don’t think that is likely. Call the Retentions Dept. and complain in a firm but courteous manner. This has always worked for me. I still don’t understand the terms and conditions. If I have an AT&T iPad 2nd generation, I can trade it in for a credit for a T-Mobile iPad and not pay any fee except for EIP? And get 1 gig of LTE every month until end of 2014? I’m not on a contract with my iPad but they will give me a credit for my used one against a new one? Right now i’m on the $70 unlimited simple choice plan. What does that get me? 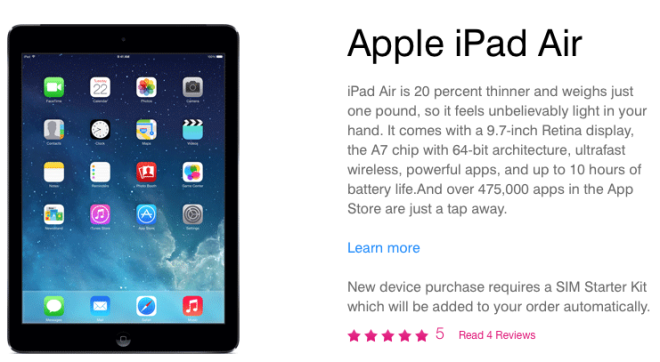 You can trade in your iPad towards a new tablet from t-mobile. You automatically get 200mb of data per month on a tablet for free, so there’s that. The new promotion is $10 off a broadband plan until the end of the year. Also in effect is The $10 monthly discount for voice subscribers, which you also qualify for. So basically you get $20 off the regular price of a broadband plan for the rest of the year and then $10 off after that. Using the smallest data plan available as an example, you could get 1.2 Gb for free ($20 reg price minus $20 discount, and an extra free 200mb) until 2015, and at that time either pay $10 a month for the same plan ($10 promo credit expires but voice discount still applies) or just drop everything and get the 200mb for free by itself. Well, I am going to take T-Mobile on their offer. My iPad 2 is showing its age. I will get $105.00 for my iPad 2 as a credit and I would qualify for $0 on EIP. Plus i get LTE on the iPad. I had been thinking about getting a new iPad for some time but didn’t want to shell out almost $700 for one with LTE. I’ve been doing some more traveling as well so this will be cool. I still don’t understand the terms for getting the hardware discount. I don’t care for EIP, which will allow me to pay off before 2014 end. Do I have to keep the 1GB plan, and if so for how long? Or are they subsidizing the savings by making us take EIP and paying for data 2015 and beyond until we pay it off in 24 installments? Then allowing us to cancel the data? This kind of defeats the savings if we don’t ever need data beyond 200mb. You only have to keep the data plan for as long as you are doing EIP as its requirement is a paid data option. After you pay off the device you can just opt for the 200mb. Thanks! So I’ll end up paying ~$200 at least for data. I guess I’ll have to think about how much I really need all that data. This is the most worthless announcement I’ve heard from TMo yet. This would be worth a damn if they had a respectable 4G network, but since I see 2G everywhere I go, I see no reason whatsoever to be sign up for this gimmick. Give me a break! Meanwhile in an actual city… I have 4g. T-Mobile announced earlier in the year that 50% of their 2G network would be converted to LTE by the end of the year, and the other half would have LTE by mid-2015. But I understand what you mean, use what works best for you until T-Mobile expands LTE in your area. You think it’s bad because you live in a place where they don’t have good coverage. But don’t say it’s worthless because you are upset lol, just switch to a provider who will give you service. Your comment is somewhat worthless. I have LTE in most places. Find another provider. Why are you still here? I’m confused. Let’s say I buy a tablet on 04/12 for the wifi-only price and get 1.2GB per month for free through the end of the year (and make monthly payments for the tablet). At the end of 2014, if I cancel the 1GB mobile Internet service, I understand I’m going to have to pay off the remainder of my tablet at that time, but would the remainder be for the discounted $130-off price, or would I have to pay the remainder of the full price (since I’m not keeping the mobile Internet plan until the EIP is paid off)? You would be paying off the remainder off the discounted pricing. I’m curious though, for BYOD customers, would any cellular enabled tablet be eligible or would I need to choose among the T-Mobile approved devices (those that the earlier “free 200MB” plans apply)? It should be any tablet. You just need to grab a T-Mobile SIM, pop it in, and activate it. Nexus 7 is $269 directly from Google. I’m not an iFan, just a personal preference, and I’m the Android tabs are last year’s models with the 4 series coming out. I guess Magenta is clearing the warehouse. However, it is a good move to help move inventory. The LTE version has 32GB, which is equivalent to the $269 WiFi model. You are correct, I’ve corrected the pricing. I am using a Spring Board,that I got from Ebay,I have hot spot with TMO,I get the $10.off what I pay for phone and hot spot plan. My question is this,can I get 1 gig plan free for the rest of the year,or do I have get new tablet to get it,would I get a discount if I give them my Spring Board or not since ths prices are lower anyway? Thanks to anyone that can tell me. 4/13 where the T-mo rep is located. Can you use the 1.2GB of data roaming in other countries as with the simple choice plans? You might have log into your My TMobile account,not just go to the TMobile site. I notice that some Odd reason TMobile will not show everything they are selling if you don’t login on your own account. Try that see what comes up. Isn’t this a subsidy for the device if you get a plan? Is there an EFT? This isn’t very uncarrier. Just got mine yesterday. $499 and 1.2 gigs a month free every month with no overage charges. Also I am not an apple fan but free LTE data ….I said F’ it even if I use it for email and web surfing its still worth it. Well, probably after dec 2014, I will revert to my free 200 mb for life plan then after I used all of my data (200 mb) before the end of the same billing period, I will sign up for the $10 additional 2 GB 4G/LTE data speed. So basically, I am paying only $10/month for 2.2 MB of data monthly which is still affordable.